This week on the show, Ghostbusters Fan Fest is now taking ticket deposits, an update on that Kevin Smith conversation, Eaglemoss’ Ecto-1 and more! 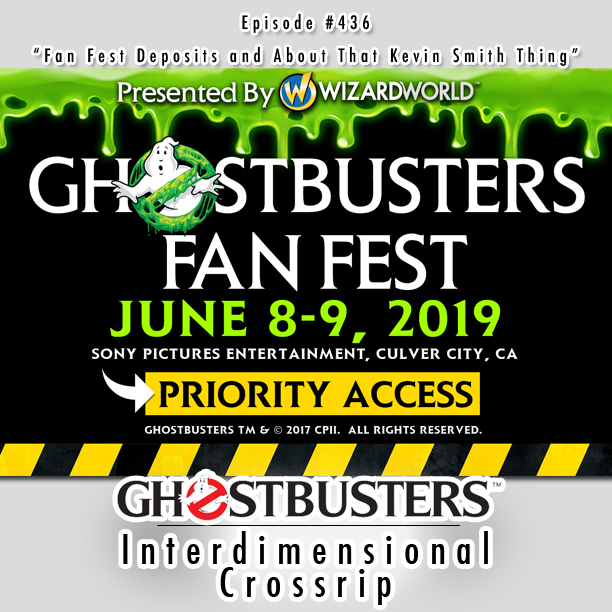 First up, some breaking news as Wizard World and Ghost Corps are now taking deposits for Fan Fest tickets that guarantee you a ticket package (but those packages are still to be announced), a comment about the Kevin Smith speculation from last week - -and confirmation from sources that he is NOT working on Ghostbusters, Eaglemoss appears to be working on a subscription Ectomobile, Ghostbusters World appears to be right around the corner, Bill Murray Stories has a trailer and an official release date, Rubies announces a Premium Halloween costume in time for this holiday season, and an update on that Ecto Cooler documentary mentioned last week. Then finally, the boys talk about the Wall Street Journal article that’s been oft-postponed. Tune in! This week on the show, talking about a new clip of Ghostbusters World gameplay, Richard Edlund's state of the VFX industry, Ray Parker Jr. documentaries and more! Troy is flying solo this week as Chris is out on vacation, but don't worry - still here to talk about all the news that's fit to print. First up, Eric at Ghost Corps showed us a little bit of Ghostbusters World gameplay. But were there a few hints toward what's to come visible on the screen? And what's with the dimensional portals? Diamond Select Series 7 is out on shelves now, and for the first time you can own Janosz Poha! SyFy has a great article with Richard Edlund looking back on his career and discussing the state of the effects industry, where of course Ghostbusters comes up. And finally, there's a Ray Parker Jr. documentary in the works, find out how you can help them fund the production! It's that time of the year again, need gift ideas for the Ghostbusters fan in your life? The Ghostbusters Shopping Network has got you covered! Chris has his annual wrap-up of items that any and all Ghostbusters fan should have under the tree this Christmas season - and this year, the good folks at Ghost Corps have teamed up with the Crossrip to offer a few of those items as a give-away for free! Stay tuned to the Crossrip social media channels for information on how to win a few collectable items! This week on the show, catching up on a few weeks worth of news in one show! The boys talk about the recently found lost scenes including the fabled Fort Detmerring sequence, Toy Fair 2017 news including Diamond Select's Ghostbusters II announcements, Bill Murray chatting GB3, a few Answer the Call tidbits including the destiny of the Egon Spengler bust, Maurice LaMarche talks Real Ghostbusters, and the top ten reasons Ghostbusters II is an underrated classic. This week on the show, all the latest news that's fit to print and a discussion about the conclusion of IDW Comics' "Ghostbusters International" series! First up, a little recap on the past couple weeks' events, some news on the Motiongate Dubai attraction, Ivan Reitman's comments about the future of the franchise (and his appearance on Canada's Smartest Person), a great article about the evolution of Slimer in Puppetry Journal, Violet Ramis Steel is writing a book about her father, the Ghostbusters of BC made a lucky kid's day, and a whole lot more! Then stick around for discussion on Ghostbusters International #11 and the exciting conclusion to the comic series that's spanned the globe! Bill Murray is having one helluva October. Not only have his beloved Cubs won the World Series, but he himself won the highest comedy honor granted by the Kennedy Center on behalf of the Mark Twain Prize. This week we celebrate a little bit of both in Murray's honor. In addition, the latest news: Playmobil sneak peeks, Ghost Corps releasing assets for the fans to get creative, Japan's killer three-disc release of Ghostbusters: Answer the Call, and a little bit of Halloween recap. Plus, listen at that half hour mark for some of your voices! So much news. So, so much news everywhere. Join Troy and Chris as they try to run it all through the spaghetti strainer to make sure you only get the al dente goodness. Kevin Smith talked international Ghostbusters (2016) trailer and brings up a couple more good points worth discussion, the Boston Herald ran an article on the theoretical science advisor to the new film (SEND US YOUR THESIS, DR. MAXWELL - did it work? ), the Russo's version of Ghostbusters is dead, wait what wasn't it only in pre-lim development? How about some details on Cryptozoic's Ghostbusters II themed board game. All that and news on Dubai's Motiongate park and the new Activision mobile game. This week, the Crossrip remembers David Margulies ("Mayor Lenny Clotch") and catches up on all the news that's fit for another podcast. Trailer Watch 2016 continues as no Ghostbusters (2016) trailer is in sight, but there's a whole lot of licensing news to talk about including Mattel action figures, Rubies Halloween costumes and a big event that took place in London this past week put on by the Rocket Licensing folks. Sounds boring? It wasn't - a good chunk of new props/gear from the 2016 film was on display and Troy and Chris feel like speculating on everything we saw. Ghost Corps wants you to know that you'll be able to have a Lazer Aventura at a Six Flags near you (and wants your franchise patches for a brand new display in their shiny offices)! Want to see GB16 early? Make a bid on IfOnly's charitable fundraising effort for a private screening before anyone else gets to see it. Want to hear some anecdotes we never knew about Ray Parker Jr.'s iconic Ghostbusters theme song and the music video that accompanied it? ScreenCrush had a great article that the boys will discuss. All that, plus a couple hashtags to use in the weeks coming on an all-new Crossrip!